Obviously, I still have pie on the brain. Except that today’s pie is in drinkable form. 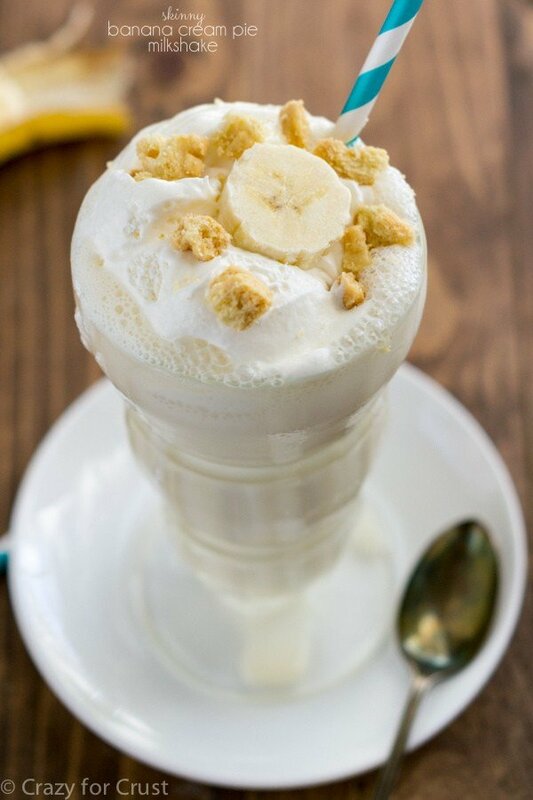 I turned Banana Cream Pie into a skinny milkshake. It’s now the middle of March, which means we are going to Hawaii in 3 months. Somehow in the next three months I have to satisfy my sweet tooth and be ready to be comfortable in a bathing suit for 7 days straight. I’m not sure how I’m going to accomplish that, especially when I have things like this pie on the brain all the time, but I’m giving it a good effort. I know that, even though we’re encroaching on the actual start of spring, many of you are still covered in rain, sleet, and snow. Here in California, it’s been in the 70s and low 80s. Don’t hate me, mmkay? I’m just telling it like it is. 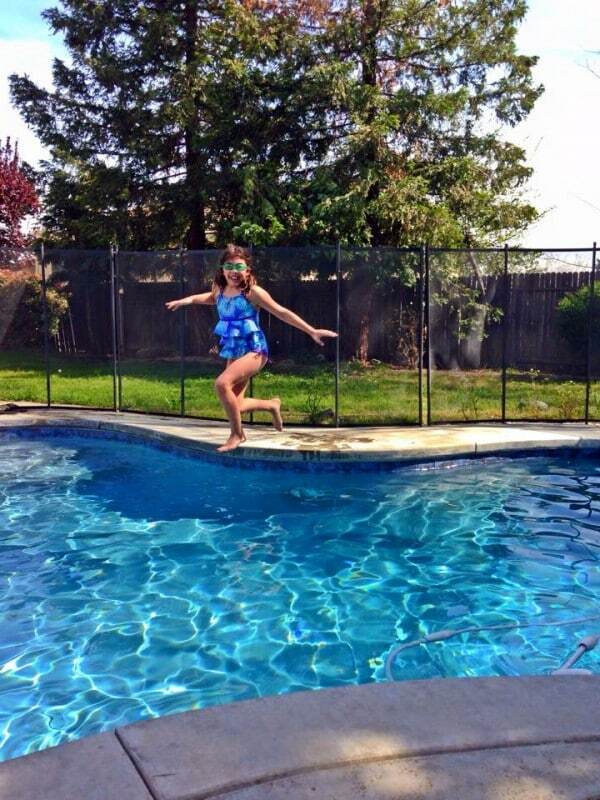 The pool isn’t heated, BTW. Even Mel wouldn’t get in. Anyway, all this warmer weather has me wanting ice cream and milkshakes. So I went off to recreate one of my favorite pies into a skinnier milkshake. The key component of a milkshake is ice cream. Ice cream + dieting is kind of a no-no, unless you can stop at one spoonful. I can’t. Can anyone only eat one spoonful of ice cream? I didn’t want to use ice in my milkshake because that would water it down, especially if I wasn’t using ice cream. And then I thought of a solution: International Delight Coffee Creamer. It comes in sugar-free fat-free varieties now and I love each and every flavor. The new International Delight Fat-Free and Sugar-Free French Vanilla Creamer kind of tastes like melted ice cream. If you freeze it into ice cubes and then blend it into a milkshake…it’s kind of like adding ice cream with out all the fat. And 1 tablespoon is only 15 calories! Once you make your ice cubes, making the milkshake is a breeze. A milkshake needs liquid to be able to blend up and be frothy and, well, milky, so I used nonfat milk. You can also substitute your favorite dairy-free milk to this recipe (unsweetened vanilla almond would be fantastic). Because it’s a banana cream pie milkshake, I added some banana. Bananas are high in calories (unfortunately) so I just added 1/2 of a medium one. I amped the banana cream pie flavor up by adding a teaspoon of sugar-free instant banana pudding. Adding the little bit of pudding mix (dry) gives the milkshake an amazing and authentic banana cream pie flavor. Let’s talk comparison. 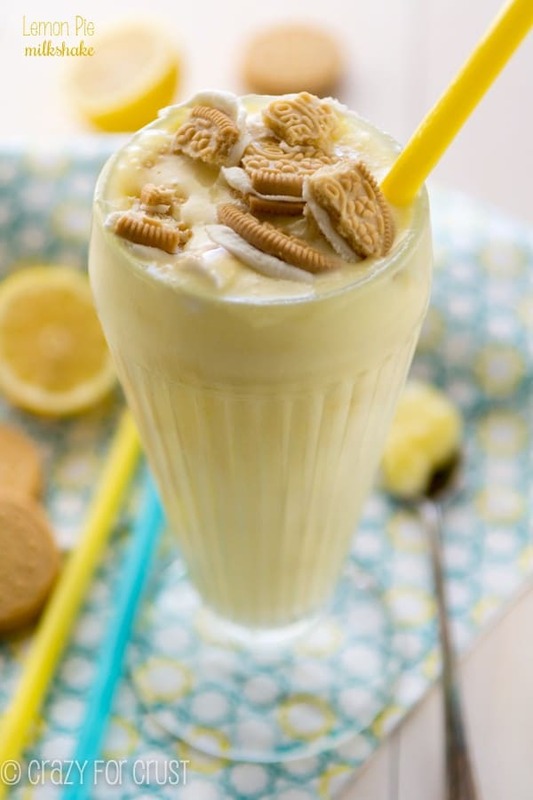 Last summer I made this Lemon Pie Milkshake. I hate doing this because who really wants to know, but that recipe (using real ice cream) has 388 calories, 15 grams of fat, and 47 grams of sugar per serving. I think this one wins. Plus, it has banana, which is fruit, which makes this breakfast. 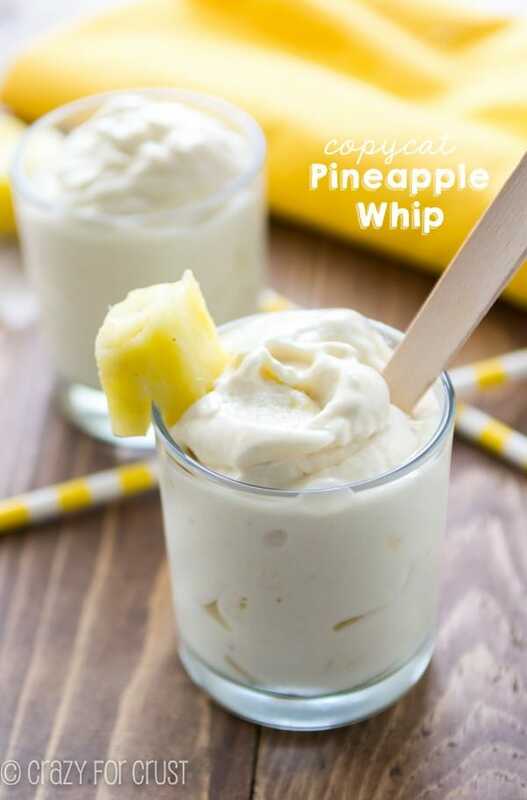 Like a banana cream pie in drinkable form! 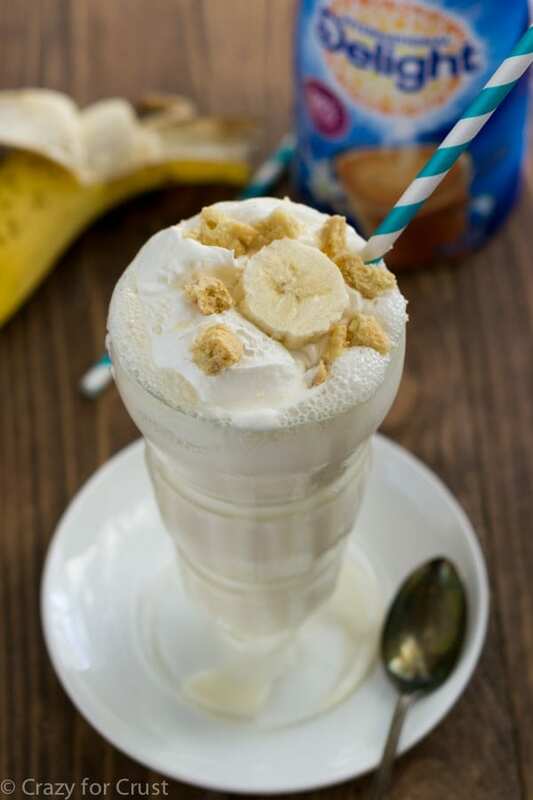 This milkshake has lower calories and fat than a traditional one and it tastes like banana cream pie! Freeze your coffee creamer in ice cube trays for at least 4 hours. Place coffee creamer ice cubes and all the rest of the ingredients in a blender. Blend until smooth. Top with additional whipped topping and a crumbled shortbread cookie for garnish. Enjoy immediately. For an adult beverage, add a shot of rum or vanilla vodka! If you love International Delight like I do, sign up for their email newsletter here! Drinkable pie AND skinny?? You’re a genius!! You’ve definitely been killing it with pies lately!! So many great ones. This is so perfect for satisfying your sweet tooth and getting “bikini ready”, or in my case I need to start on my “wedding diet”! Would I be bad if I added a shot of rum? 🙂 Sounds amazeballs! Um, yes please. Add an extra one for me! I LOVEE skinny shakes and smoothie! 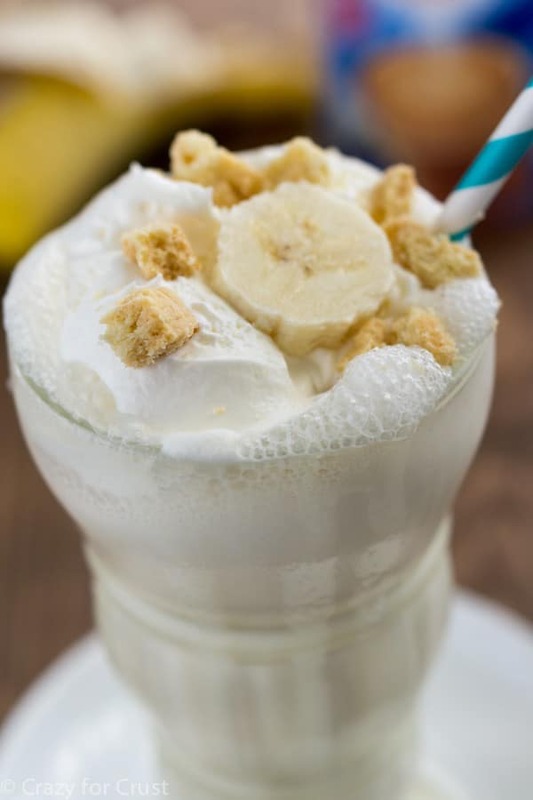 This banana cream pie shake looks delish! 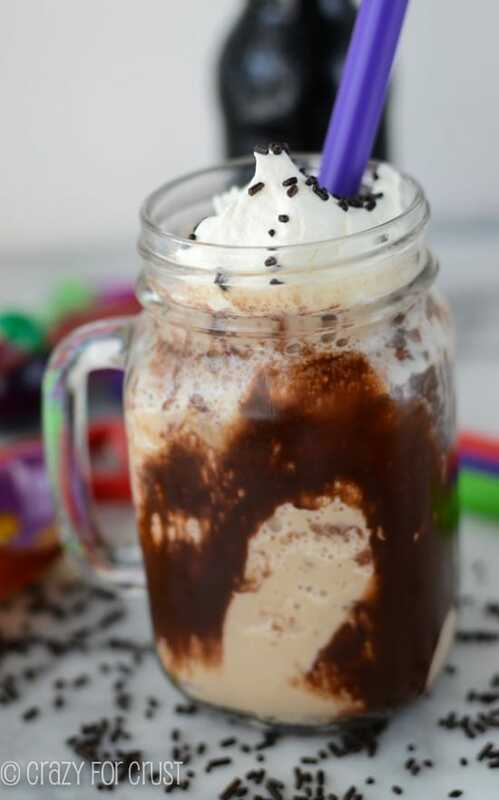 This milkshake looks so decadent, I love that it’s a skinny version. Banana cream pie anything is always a favorite around our house! I would have never thought to freeze coffee creamer and use as a substitute. what a great idea – MUST TRY! thank you. and seriously, who can stop at one spoonful of ice cream?? thank you for this, love the alcohol option and the “22 BEST Smoothie” recipes that this was linked to!